Silk City: What makes Madinat Al Hareer in Kuwait the next big thing? Progressing fast and strong, the Kingdom of Saudi Arabia continues to be a land of monumental projects. Every year, its landscape welcomes a variety of projects in the residential, hospitality, retail, and tourism sectors. Furthermore, the emergence of mega projects across the Kingdom is in line with the country’s Vision 2030. Through the vision, the GCC state hopes to diversify its economy through investment. As the nation shifts away from an oil-based economy and towards a diverse and sustainable one, it brings us some of the most incredible projects from across the world. Here are the top projects in Saudi Arabia that came to life in 2017. Located east of the Haramain Expressway, the Jeddah Gateway project is a residential development which covers an area of 192,000 square meters. With 30 buildings of eight to 16 floors, it will offer a total of 1,952 units. Furthermore, each floor will include four to six apartments with balconies and various other facilities. Featuring 3 and 5-bedroom apartments, with an area of 134 square meters and 196 square meters respectively, the unit prices will range from $98,610 to $157,243. The development will also include educational, healthcare and religious facilities. In addition to a hypermarket and a 47,590 square meter commercial center. Furthermore, 40% of the project’s area will be covered in lush greenery. 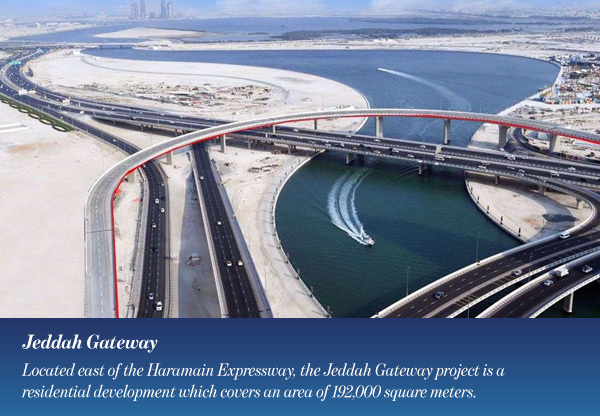 Jeddah Gateway is the Saudi housing ministry’s second project in Jeddah for local citizens. 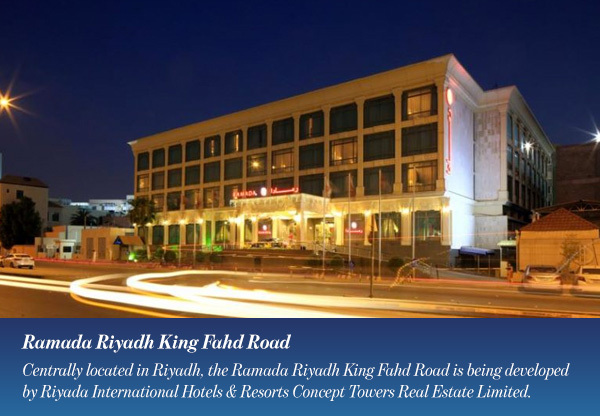 Centrally located in Riyadh, the Ramada Riyadh King Fahd Road is being developed by Riyada International Hotels & Resorts Concept Towers Real Estate Limited. Ramada Riyadh King Fahd Road features 189 guest rooms, including 84 suites and 105 standard rooms. It also includes over 200 square meters of meeting space, an indoor pool, spa and a modern gym. As well as three food and beverage outlets, including an all-day restaurant, lobby lounge, and a cafe. The hotel is set to become 11th Ramada in the country and the 18th hotel under Wyndham Hotel Group’s portfolio of brands. Expected to open in 2020, the hotel is within proximity to banks, commercial offices, trading companies and wholesale entities. Moreover, it is close to main tourist attractions such as the National Museum, Al Murabba Palace, and King Abdul Aziz Public Library. This is not only one of the top projects in Saudi Arabia but in the world. 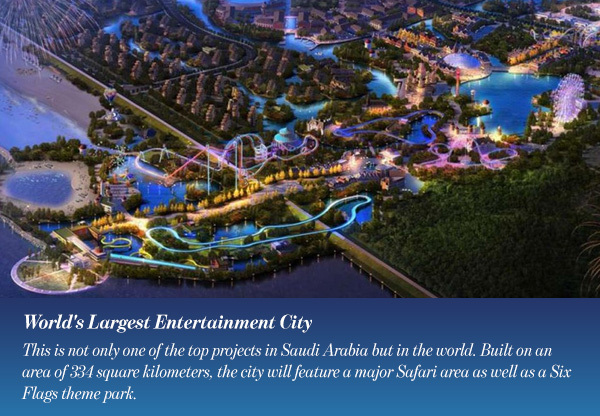 Built on an area of 334 square kilometers, the city will feature a major Safari area as well as a Six Flags theme park. Located in Al Qidiya, southwest of Riyadh, the city will also include sports, cultural and recreational facilities. The laying of the foundation stone is set for 2018, while phase one of the project is expected to launch in 2022. The project’s main investor is the Public Investment Fund, along with a number of other local and international investors. As the biggest of its kind in the world, the new mega project is part of Saudi’s Vision 2030 development plan. 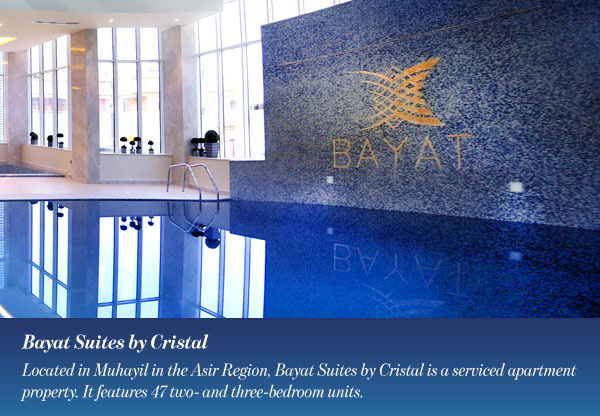 Located in Muhayil in the Asir Region, Bayat Suites by Cristal is a serviced apartment property. It features 47 two- and three-bedroom units. Equipped with the best facilities, each apartment features beds with luxurious pillow top mattress, a fully fitted kitchen, an HD television, working desks in every room, and WiFi. As well as a dining table with six chairs, a baby crib, and bathroom amenities. Furthermore, some apartments will provide a maid room with an attached bathroom. Bayat Suites boasts a unique location near Hospital Muhayil Al Ahli on King Abdul Aziz Road. Its prime location, along with its facilities and affordable accommodation, provides modern travelers with all their needs. 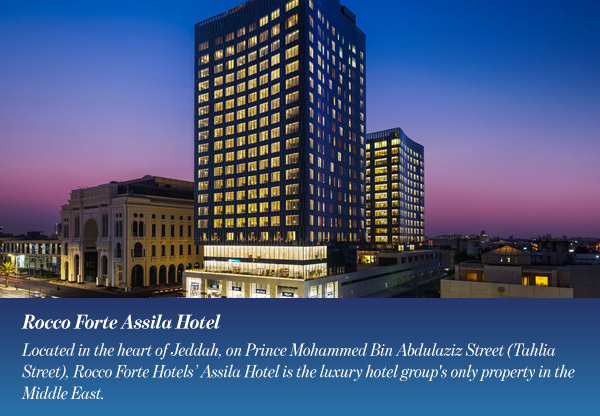 Located in the heart of Jeddah, on Prince Mohammed Bin Abdulaziz Street (Tahlia Street), Rocco Forte Hotels’ Assila Hotel is the luxury hotel group’s only property in the Middle East. Spread across two large towers, the hotel features 147 rooms, 63 suites, and 94 residential suites. Furthermore, the residences are the first fully serviced residential apartments in Saudi Arabia. This hotel also includes 2,000 pieces of artwork created by Saudi artists. Moreover, it offers fine dining at the Twenty Four restaurant and Italian patisseries, ice creams, and cakes at Il Caffé coffee lounge. As well as traditional Arabic mezze served Al Fresco on the hotel terrace. The hotel’s endless facilities definitely make it one of the top projects in Saudi Arabia. 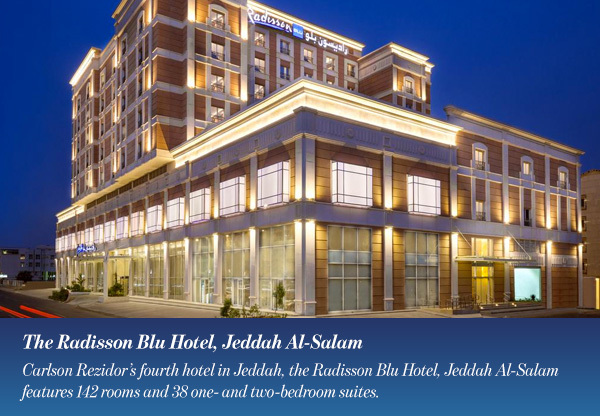 Carlson Rezidor’s fourth hotel in Jeddah, the Radisson Blu Hotel, Jeddah Al-Salam features 142 rooms and 38 one- and two-bedroom suites. It also includes10 meeting rooms and two ballrooms and a flexible space that can accommodate up to 800. With an all-day dining restaurant and lobby cafe, the hotel makes the list of the top projects in Saudi Arabia. It also features an outdoor pool and a juice bar, as well as designated areas for men and women. The hotel is within proximity to many shopping destinations and King Abdul Aziz International Airport. 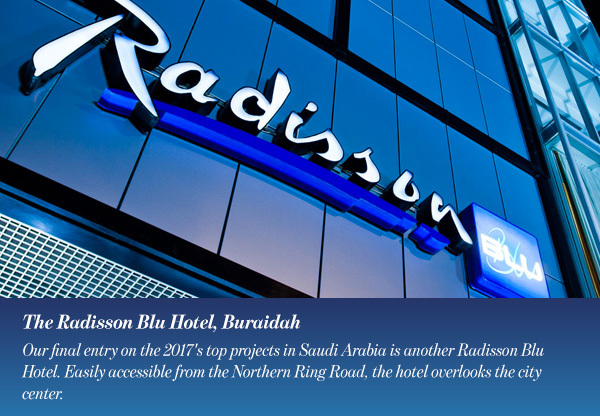 Our final entry on the 2017’s top projects in Saudi Arabia is another Radisson Blu Hotel. Easily accessible from the Northern Ring Road, the hotel overlooks the city center. The Radisson Blu Hotel, Buraidah is only 5 km away from the center. it is also 25 km from the Prince Naif International Airport. Furthermore, hotel guests will find themselves a short drive away from Al-Nakheel Mall and the industrial area. The hotel features 110 guest rooms and 12 villas as well as five meeting rooms and a flexible meeting space. It also includes a Health Club with a Sauna, Steam Room, and Spa Facilities. In addition to a lobby lounge and an international cuisine restaurant. Construction The New World Centre: What makes Neom City project stand out?